What the baseball bat is to Louisville and what fast cars are to Indianapolis, the heritage of high school basketball is to many small towns throughout Indiana. And for that matter, to small Ohio towns, too — for sure! No exception is Fort Loramie, which has the opportunity to showcase its boys basketball team on Saturday night at 6 p.m. in the renowned Hoosier Gym, which was the site of many on-court and locker room scenes in the memorable 1986 feature film. “Hoosiers” offered the popular, heart-warming story of small school basketball success and also embodied the importance of community, family, friendships, and positive values — plus redemption. “It’s a privilege for our team and fans to be a part of a great Indiana tradition by playing and attending a regularly scheduled season game in this unique and historic venue that today serves as a monument to the film,” Fort Loramie coach Corey Britton said. The Hoosier Gym is at 355 North Washington Street in Knightstown, Indiana — three miles south of Interstate 70 and about 45 minutes west of Richmond. In “Hoosiers,” Hickory upsets South Bend Central 42-40, emulating the real-life 1954 version of Milan’s stunning 32-30 triumph over powerhouse Muncie Central. Milan’s student enrollment in grades ten though twelve was the smallest in the entire state. Muncie was among the three or four largest schools. Back then, all Indiana high schools were lumped into a single basketball tournament. In the early 50’s, more than 30 Indiana radio stations closely followed the one-of-a-kind tourney and provided play-by-play of the state’s Final Four. Fort Loramie will be well covered throughout Indiana this weekend, too. Britton pointed out that media in the neighboring state to Ohio have taken contests played in the Hoosier Gym so seriously that most of them, including the upcoming Redskins game, are televised to ensure that Hoosierland viewers can watch “live,” and imagine a modern day form of the film’s game action every week or two. In fact, Bob Garner, who coordinates the facility’s special events, told ScoresBroadcast that as many as six TV cameras could be perched in various locations on Saturday. A wide-angle lens may be hung high above the court to provide an eye-catching perspective of play spanning 84 feet. Another lens aimed down through the rim and net will be lodged directly above the backboard at one end. An accompanying microphone will catch sounds of the ball as it skips around the rim or rolls down through the ropes. Tipoff time for the Fort Loramie tilt with Strasburg-Franklin from northeast Ohio is set for just after 6 p.m. Jack Kramer and Chuck McBee will be perched above the seventh and top row calling the game for ScoresBroadcast.com. Webcast time is 5:40. Jack and Chuck will also be at courtside for the Anna/Fort Loramie duel on Friday night at. Junior varsity squads square off at 6:30 and 4:30 on Friday and Saturday, respectively. Fort Loramie’s varsity, which walloped Bethel on Tuesday, is 12-6 heading into the weekend and has won 9 of its last 11. In Strasburg, the Redskins tangle with an opponent that has already secured its league championship, features more height than Loramie, and is coasting along at 14-4. The ‘Skins would seem to be the underdog. The Division IV Tigers play in the Inter-Valley Conference, which includes D-IV Berlin Hiland in the opposite half of the league. D-III Sugarcreek Garaway, also a conference member, lost to the Fort Loramie girls at Ohio Dominican in late December. Rebounding from a tough Shelby County Athletic League tilt on Friday, the Redskins make the quick turn-around early the next evening nearly two hours from home. Meanwhile, Strasburg-Franklin hauls a bus five hours across Ohio, but hasn’t played since Wednesday. The team visits Indianapolis on Friday. 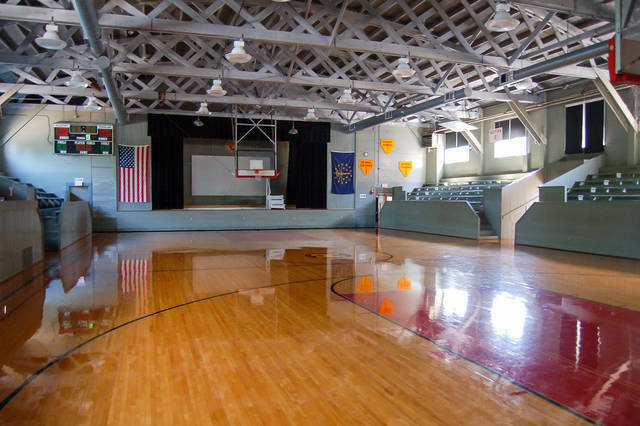 Schools from as far away as New York and Mississippi are hosted each year by the Hoosier Gym, which is designed to enable high school athletes to experience a contest in this shrine to basketball. On Saturday, Fort Loramie gets a chance to experience the game of hoops as it was in the era of the fictional Hickory Huskers. In the actual state final, tiny Milan High School — with only 22 boys in the senior class — shocked the world when guard Bobby Plump held the ball for a full minute before drilling a 20-foot horn beater. Who knows? The Redskins, losers of four in the final seconds and two at the buzzer, are due to flip the script and win one the very same way Milan and Hickory did!